Fringe bikini tops are everywhere right now! Well guess what? You don’t have to spend a bunch of money to get one. Just take a bikini top you already have, and slap some homemade fringe on it!! You will need a bikini top you don’t mind altering and some swimwear knit of your choosing. I got black and metallic pink. This typically runs $10-$15/yard. Luckily you’ll only need a quarter of a yard, so it won’t hurt your wallet. 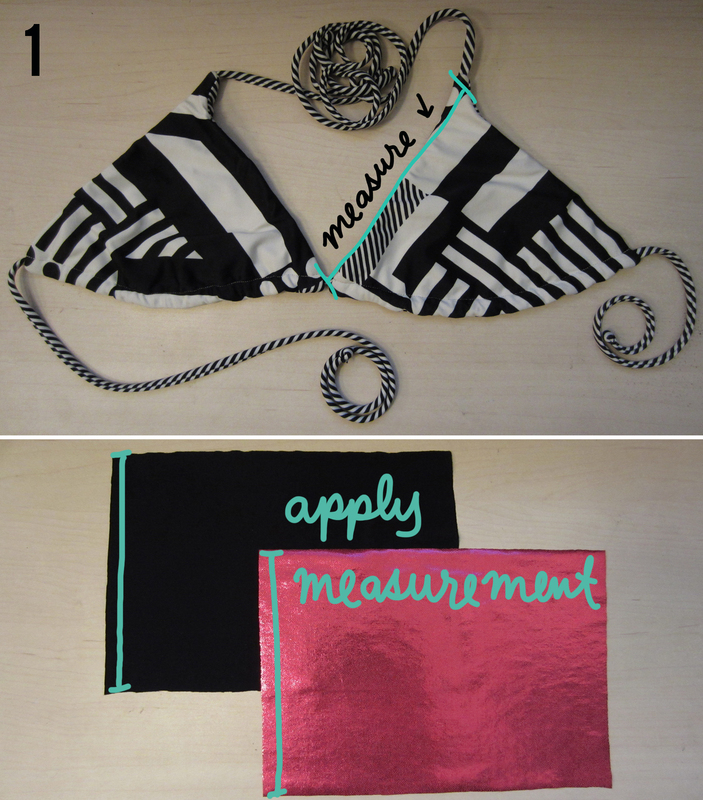 Step 1: Measure the top edge of the bikini. Cut out rectangles from the swimwear knit with that measurement as the width. The length is up to you; my patron wanted super long fringe. 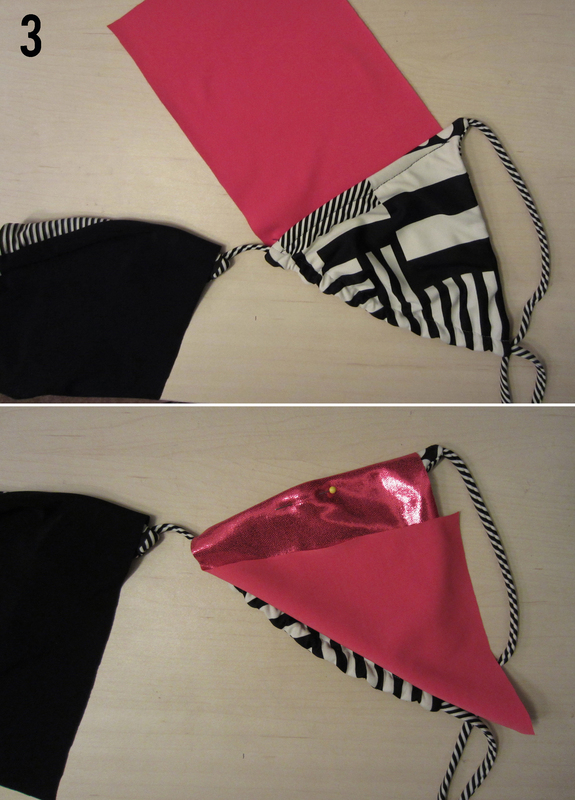 Step 2: Pin the edge of the right side of the rectangles to the wrong side of the bikini top. Here are front and back views. Step 3: Sew the swimwear knit to the bikini. I would suggest using polyester thread for this. My reasoning is that polyester will probably be more water resistant than cotton. After all, this is for swimming, right? Or at least risking yourself to inadvertent splashing while sunbathing. I only had black cotton thread on hand, but I didn’t have a proper ball point needle either (for sewing knit material) and that didn’t stop me! 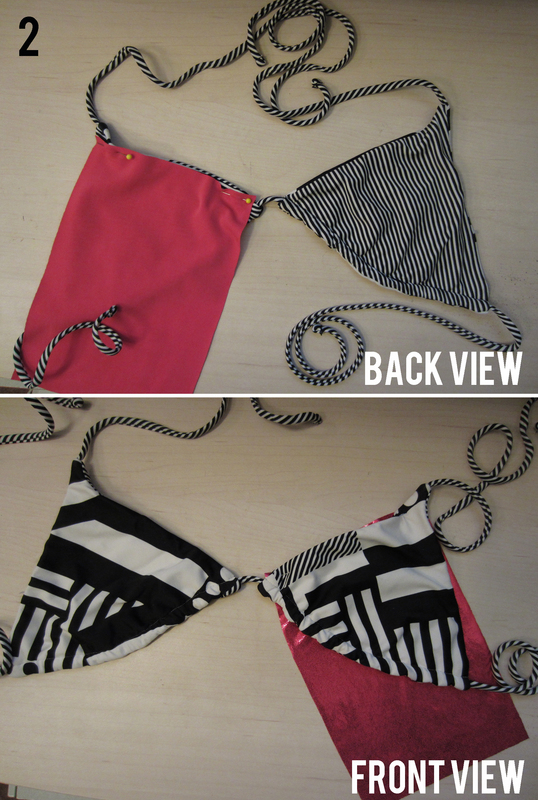 Step 4: Flip the rectangles over to the right side of the bikini top and sew in place. Step 5: Cut small strips to make fringe! Don’t be afraid to cut all the way up to the seam. Now you’re ready for the pool! Or a glamourous rodeo. Cute color-combo! You are so stink in’ creative! Is there a tutorial for adding fringe to the bottoms too? For extra modesty? where do you get the swimsuit material? I got it from Jo-Ann’s. The fabric I purchased was actually dancewear knit, which works just as well! Oh no! What helped me is having large, super sharp shears so it only takes one cut for each piece of fringe. You could also draw lines with a ruler for guides!